As I awoke with the sound of the airconditioning turning off, I didn’t had to remind myself where I was. I can still feel subtle rocking, though very mildly, it was very clear that I was on a boat. Quickly, the excitement came over me as I scooted my body up reaching for the window. I was, without a doubt, waking up in another world. There I was, in the middle of nowhere, surrounded by limestone rock formations of different shapes and sizes. The sun has barely risen, and as the golden ray hits my face, it was clear to see that Halong Bay, is indeed another dimension of paradise. 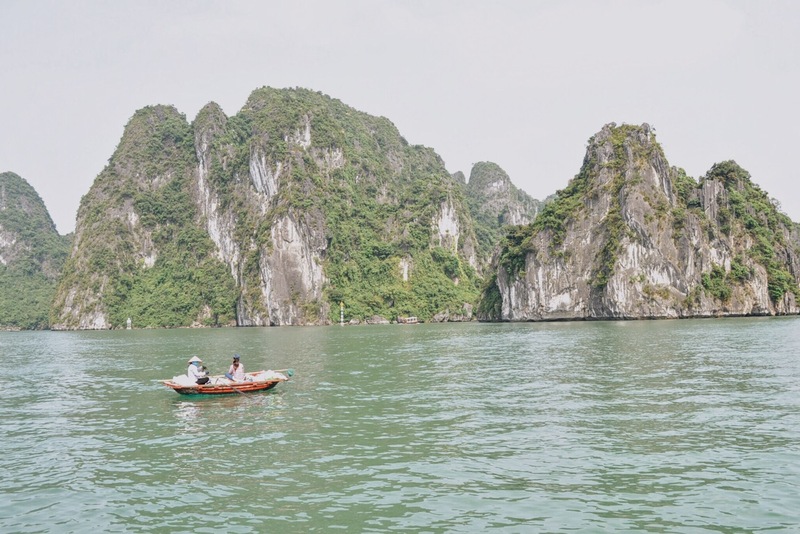 Nowadays, you can’t google images of Vietnam without coming across a photo of what is now a world-renowned wonder, a UNESCO heritage site, and a classic Vietnamese beauty– Halong Bay. 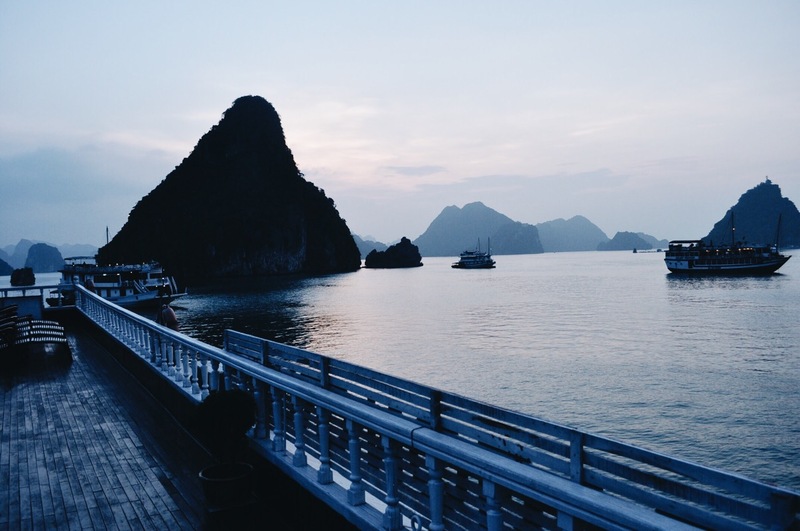 The first time I’ve heard of Halong Bay, I knew right away that I must go. There is no maybe, there is no if. It was an instant imprint that unquestionably became one of the main reasons I even wanted to go to Vietnam in the first place. But then again it has also become a destination cliche. 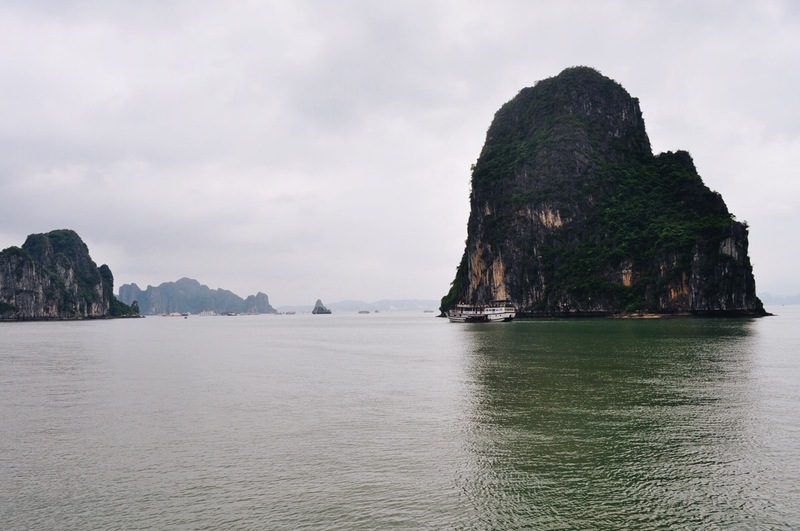 Touristy, popular, and a tendency to get pretty crowded… is Halong Bay as amazing as it looks in the photos? To avoid any unnecessary confusion, I’ll answer the question for you right now. 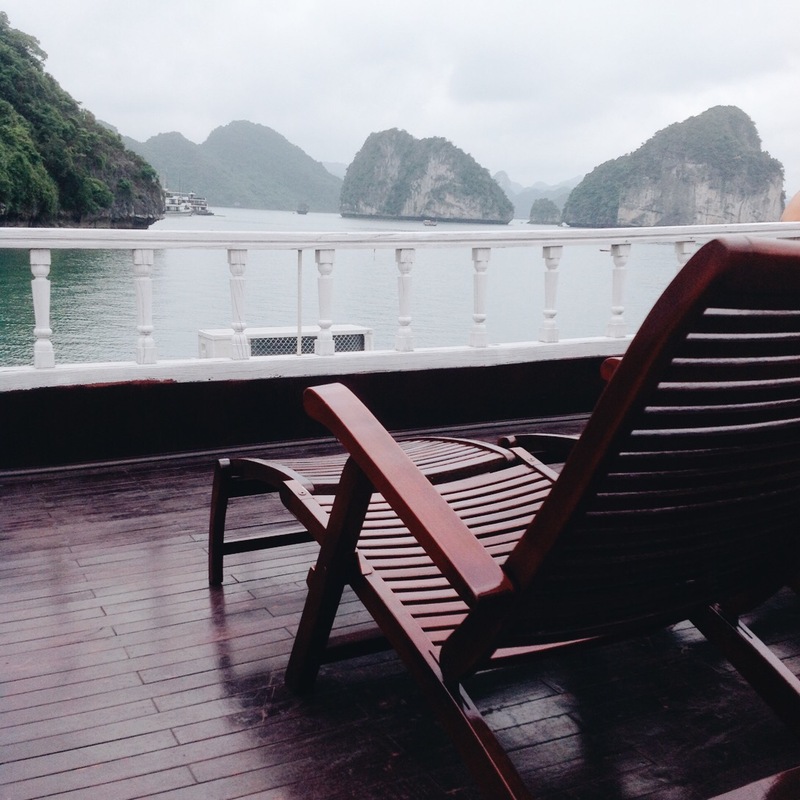 Is Halong Bay even worth it? Hell yes. And with this post, I’ll show you why. What makes Halong Bay memorable are the hundreds of limestone rock formations surrounding the entire bay. Imagine waking up and staring out your window to these islets all around you, birds flying around, right in the middle of nowhere. It’s kind of like waking up to a dream, to be honest. You may have seen Thailand or El Nido’s glorious rock formation along their pure beaches, but Halong Bay is a different experience. Is it better? No, not entirely, if not at all. But Halong Bay is something else. If you come here on a day tour, it might not be as special if you’ve already been to El Nido. The true magic lies on the moment that you open your eyes in the morning and you’re caught in a real life fantasy. 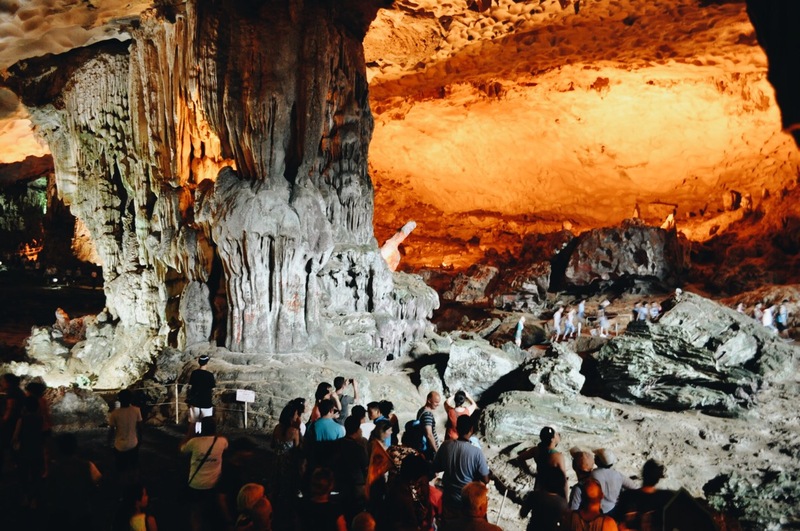 As a part of our Halong Bay tour itinerary, we hiked down to the incredible Sung Sot Cave, which literally translates to Amazing Cave. The cave is huge, and though it’s a little modified with steps and lights, it was quite amazing indeed. Beautiful rock formation sightings kept my eyes busy with admiration. I was impressed alright, and it might even be the prettiest cave I’ve seen so far. The hike down was short and almost effortless as far as I can remember. And though it could get crowded with tourists, the chambers are massive enough to accommodate a lot. The best part is that it was like being in an airconditioned room once inside. During the late afternoon, we found ourselves docking at a beach. A beach?! Hell yes, a beach. I wasn’t expecting no El Nido like lagoons, but an hour on a beach is always a good idea. But the beach isn’t the highlight of Ti Top island. 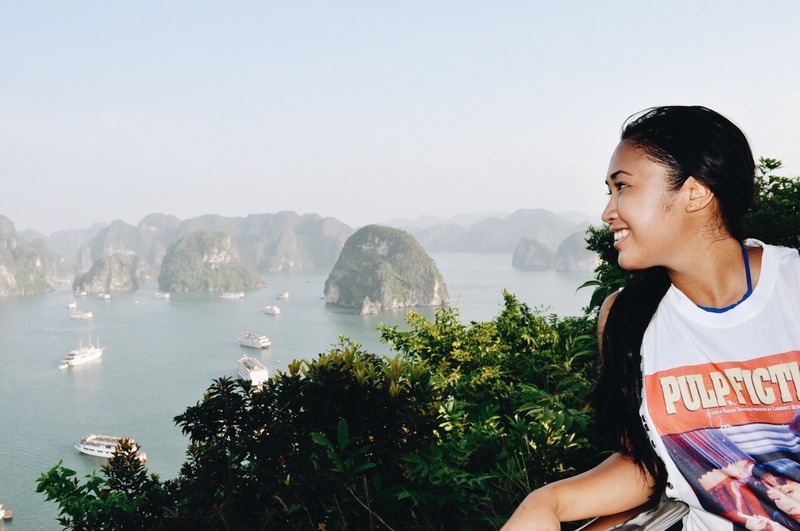 427 steps up above, and you’ll find yourself rewarded with a breathtaking 350 degree panoramic view of Halong Bay. Worth the trouble? Hell yeah. A little leg cramp the next day wasn’t too bad to bear. It was both a good thing and a bad thing that the tour we went with isn’t fully booked. Other than a group of three marines and another local couple from Saigon, we basically had this cruise all to ourselves. It was a bad thing because it would have been great to meet more people, but it was more of a good thing after all because it was ultimately intimate. We watched the sunset at rooftop while sipping on some tea. After a long afternoon exploring caves and heights, I couldn’t think of a better way to witness the sunset. The silence around us was calming, and though there were other boats nearby, it felt as if we were the only ones around. The birds flew by, as if watching over us, as the sun illuminates the water, slowly, but surely. After dinner, we kareoked the night away, singing classics from our generation from Alanis Morisette to Slice Girls. Before heading to bed, I found myself staring out in the night sky, where stars and constellations brightly showed themselves off. A couple of beers later, I dozed off in my bed as the slowly rocking of the boat put me to sleep completely. We were scheduled to go kayaking around before heading back to the port. Blame my laziness and my sore legs, but I had to pass on this and stay on board instead. I spent my morning basking under the sun and inhaling the freshness of the air and with that, I was happy enough. On our way back, they gave us a short cooking lesson where they showed us how to make fresh spring rolls. Not a bad way to end the trip at all. 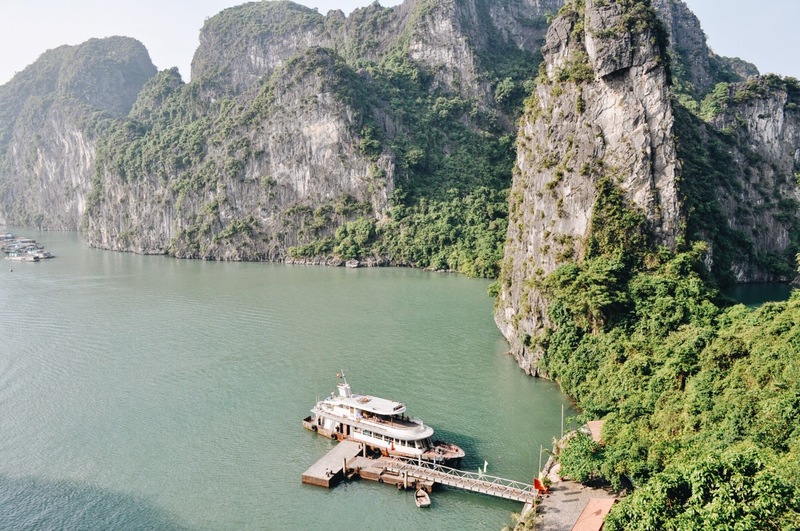 Deciding what kind of tour you’re doing in Halong Bay is crucial to your overall impression. There are plenty of different tours ranging in length and “luxury” that would fit anyone’s schedule and budget. From day tours, overnight tours, to a 3-day tour, all you need is to figure out which one works best for you. 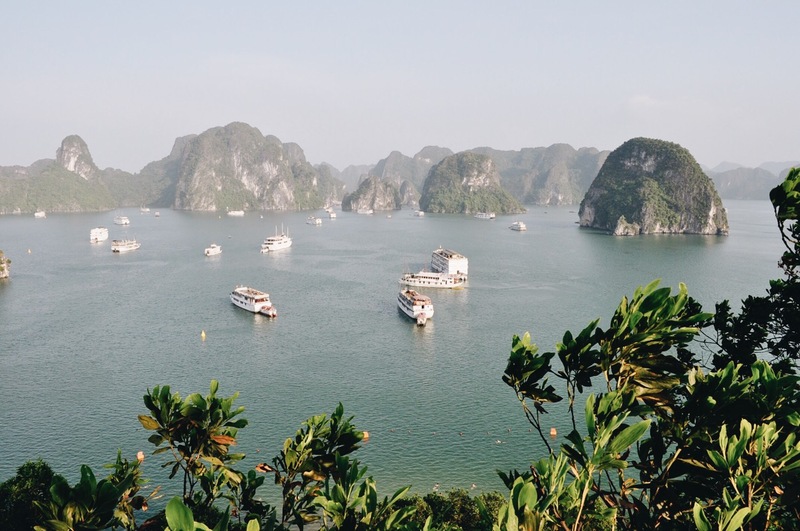 I did the overnight tour because I knew right away that a day tour just wouldn’t do Halong Bay any justice, and because I didn’t have enough time to do a three day itinerary. Price ranges from cheap to expensive and of course, you’ll get what you paid for. I originally wanted to do the infamous Castaway Tour, which is basically more catered to the partiers and those looking to socialize, but like I said, I didn’t have enough time. Other tours offer different activities on and off board such as squid fishing, visiting floating villages, and staying the night on an island. It’s important to know what you’re looking for to see what tour fits your ideal Halong Bay cruise. 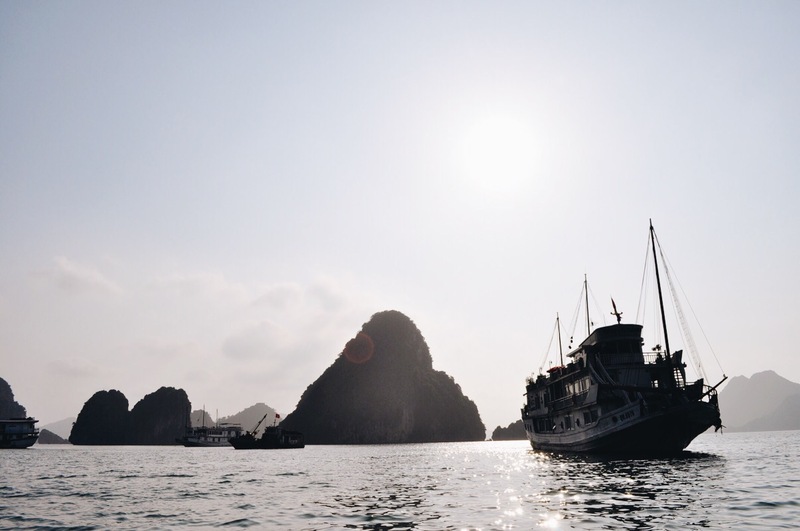 We paid $100 each for our overnight tour, inclusive of roundtrip land transfer from Hanoi, all meals on board, and a few other gorgeous stops around Halong Bay. Our boat was decent and so were our room, but remember that electricity is dependent on generators and ours unfortunately was quite limited. But if you have more to spare for a more luxurious cruise, by all means, do so for your added comfort. 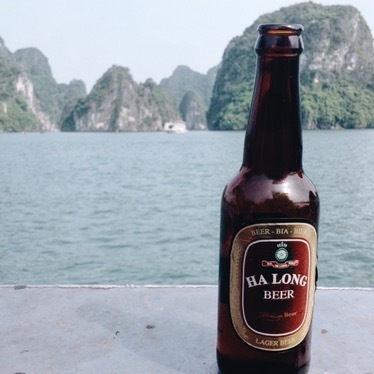 So back to the question again, is Halong Bay even worth it? Yes. Every. Single. Cent. 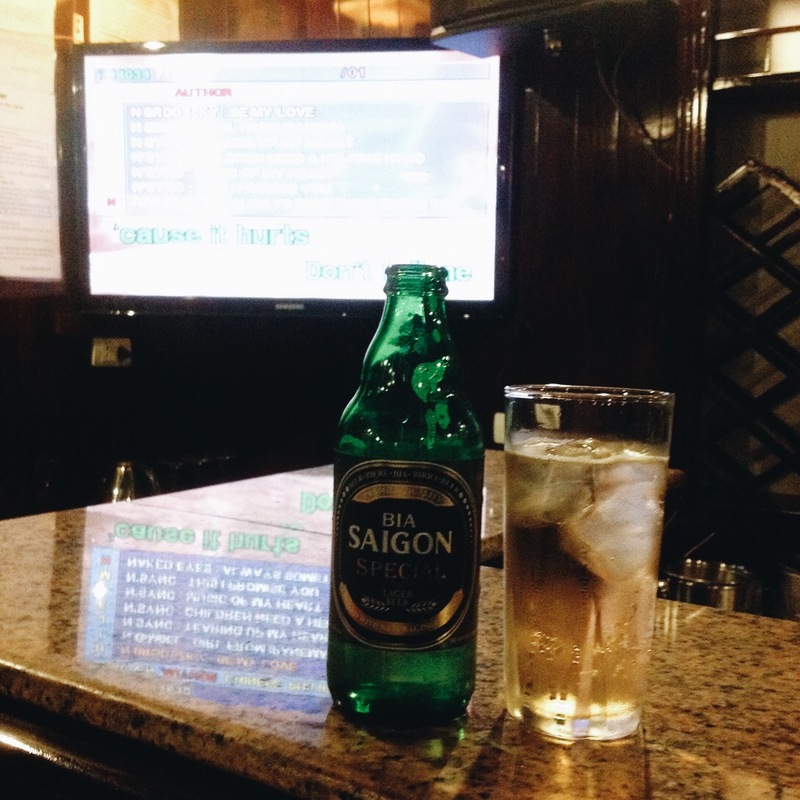 Vietnam, you’ve won me over. ***Halong Bay is a four hour bus ride from Hanoi. 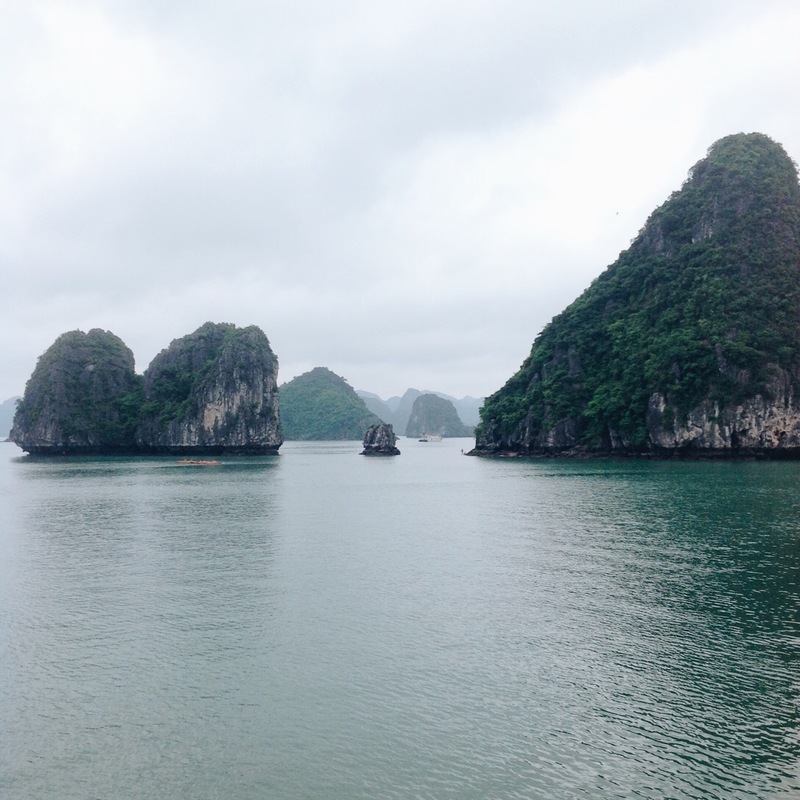 It is best to fly into Hanoi if you’re planning on making a trip to Halong Bay. ***Some of these amazing photos were taken by friend Monica.